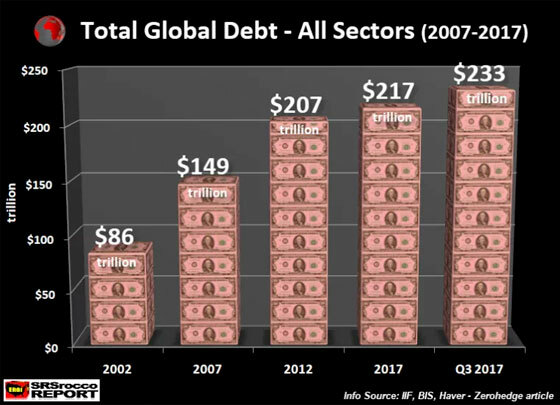 Some nasty dark clouds are forming on the financial horizon as total world debt is increasing nearly three times as fast as total global wealth. But, that’s okay because no one cares about the debt, only the assets matter nowadays. You see, as long as debts are someone else’s problem, we can add as much debt as we like… or so the market believes. There are a few items in the Credit Suisse’s summary above that I would like to discuss. First, how did the world increase its global wealth at a rate of 6.4% in 2017 when world oil demand only increased 1.6%?? As we can see from the IEA – International Energy Agency’s Global Oil Demand table above, total world oil demand only increased 1.6% over last year. Thus, the rate of increase of global wealth of 6.4% in 2017 was four times higher than the 1.6% increase in world oil demand. I would imagine some readers would stand on their soapbox and emphatically claim that energy has nothing to do with wealth creation. Unfortunately, these individuals somehow lost the ability to reason along the way. And we really can’t blame them for making such an absurd remark because they probably believe their food magically appears on the Supermarket shelves. Second, the financial wizards at Credit Suisse reported that global wealth also outpaced the population growth. What they are suggesting here is that the “Millenials” who (many) are becoming wealthier by sitting in front of a screen and clicking on a mouse than their grandparents (the poor slobs) who were mainly working in the manufacturing industry by producing real things. Third, while the Credit Suisse analysts stated that the Millenials were facing some disadvantages, there was a bright spot with a recent surge in the number of Forbes billionaires below the age of 30. Well, ain’t that a lovely statistic. What once took an individual at the ripe old age of 55-70 years to achieve a billionaire status, now can be done right out of college. It’s probably not a good sign for the economy going forward that we are seeing more billionaires below the age of 30. As we can see, total global debt increased from $217 trillion at the beginning of 2017 to $233 trillion in the third quarter of 2017. That is a $16 trillion increase in global debt in just nine months. While U.S. GDP hit $19 trillion in Q3 2017, if we add another quarter for the increase in global debt, it could surpass $20 trillion for the entire year. So, even if global wealth surged in 2017, so did world debt. According to the data, global wealth increased by $16.7 trillion in 2017 while global debt expanded $16 trillion… nearly one to one. However, this is only part of the story. 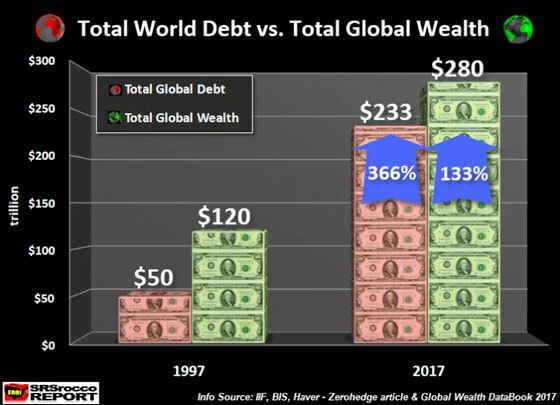 If we compared the percentage increase in global debt versus global wealth, global debt is rising at nearly three times the rate of global wealth. Furthermore, doing simple arithmetic by substracting DEBTS from ASSETS, global net worth fell from $70 trillion in 1997 to $47 trillion in 2017. By putting the numbers together, right in front of our eyes, we can clearly see that the world is going broke by adding debt. Basically, we erased $23 trillion in Global Net Wealth in the past 20 years. However, I believe the situation is much worse than the figures shown above. For example, I came across an article several months ago on Zerohedge that also reported the increase in global debt, stated it did not include FX Swaps, etc. According to their data, Foreign Exchange Swaps likely exceeded $13 trillion. FX Swaps are more short-term debt instruments, but they are still debt instruments. Moreover, we have no idea what other nasty debts or obligations are hidden out of sight of the public. Regardless, if we were just to include the FX swaps worth $13 trillion, the estimated net worth of Global Wealth would only be $34 trillion ($280 – [$233 +$13] = $34). 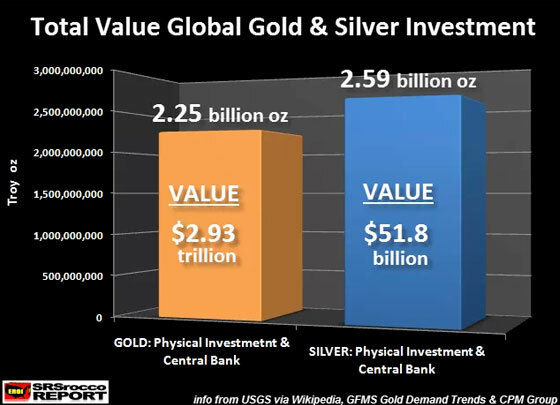 Thus, $3 trillion in the value of world gold and silver investment equals a little bit more than 1% of the $280 trillion in global wealth. However, if we are clever and remove the debts, the real NET WEALTH is closer to $34 trillion. Thus, total world gold and silver investment comprises nearly 10% of GLOBAL NET WEALTH, or ten times higher than it is currently valued. Furthermore, we must remember, physical gold and silver, purchased and held in one’s hand has no debt attached to it. Of course, this assumes that an individual didn’t take a loan out against their precious metals holdings. Thus, the precious metals have always been the highest quality stores of wealth for 2,000+ years… even though the Millenials forgot about them for the promise of millions of Crypto profits. Unfortunately, the situation is much worse than what the figures in the charts above reveal. Why? Because, the only way that debts can be paid down is if we have another $233 trillion worth of profits from economic activity, correct? Now, I am not talking about $233 trillion in costs; I am talking about PROFITS. Big difference. To pay back $233 trillion in debts, we have to burn one hell of a lot of energy… don’t we? That’s correct; we have to burn energy to create economic activity. And not just plain ole economic activity, PROFITABLE economic activity. Well, we are in BIG TROUBLE because we have been burning one hell of a lot of oil (95+ million barrels per day), but global debts are increasing faster than global wealth. So, it’s just a matter of time before GRAND FACADE comes crashing down.